I’ve been on a purging kick lately (if you follow me on Snapchat, you probably already realized that 😉 ). It started with my roommate (a.k.a. my sister) asking for more space for her things. It’s always a battle for more space when three sisters share a room I’m pretty sure. I’d been thinking about going through wardrobe anyways, so once she put the bug in my ear, I couldn’t shake it. I decided to spend a Saturday “decluttering” as I like to call it. It was only a few months ago I went through all my clothes and got rid of a few bags full of stuff. But now that summer is mostly over, I’ve noticed there are many items I didn’t wear (or didn’t wear enough to merit keeping). I love reading about the minimalist movement (this, this, and this blog are some of my favorites) and am attempting to move in that direction with my material things. Although I am not a super neat person, too much clutter can stress me out. If my desk is messy with papers everywhere, I have trouble focusing and getting work done until it is cleaned up. 1. 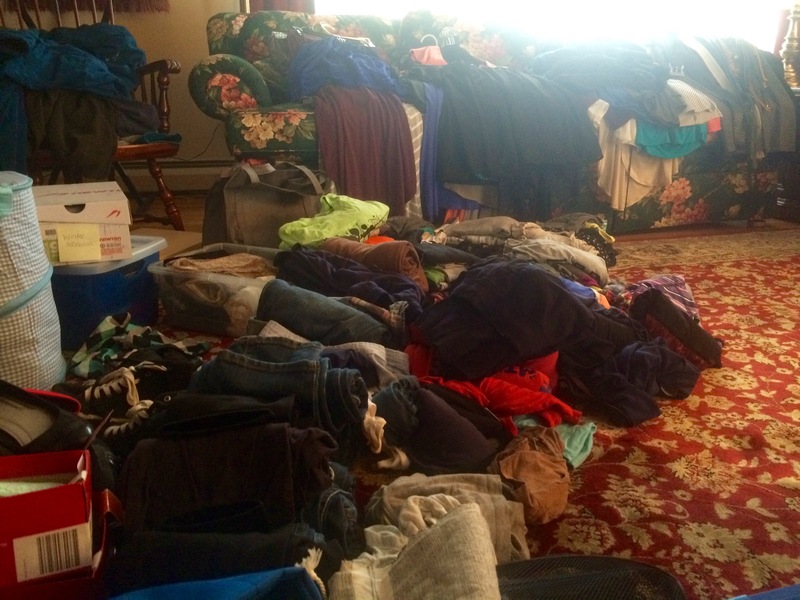 Laid out ALL of my clothes (I included shoes, bags, and travel items in this too). It was tempting to just go draw by draw or to work on one section at a time. But by laying everything out, nothing was able to escape the purge. It also allowed me to see what items really didn’t match anything else or didn’t fit with my evolving style. 2. Blasted music. Jammed out to Fifth Harmony, MKTO, and Ariana Grande. I don’t care if you judge. 3. Poured a glass of wine. Party of one here. 4. Set up my “donate,” “toss,” and “keep” bins. If you have time and the right clothes to sell, I’ve heard that can be a great option to add too. I also added a few other categories: “back up” for duplicates of the same clothing article that I don’t need right now but don’t want to get rid of; “reuse” for items that I might be able to fix or make into something else; and “cold weather” for seasonal clothes. 4. Started with the outliers. Staring at all of my things just sitting there was a little overwhelming. I was surprised by how much I still owned (even after cleaning out not all that long ago). To get me moving, I decided to go through my bags and travel gear first to ease into the process. There was less to go through, and I was able to build confidence in throwing things in the “donate” bag. If the answer was no to any of these, it went in the donate (or toss) pile. 7. Created a special occasion bin. I ran into an issue when I came to my business clothes. I rarely ever wear them as my office environment is more “start up causal” than business causal. But I never know when a business event will pop up or the occasion will call for something a little nicer than my typical office wear. So I put my business clothes in storage so they aren’t cluttering up my wardrobe, but I’ll have them when I need them. 8. Put questionable items in storage. There were a lot of things that I didn’t feel comfortable getting rid of yet, but wasn’t sure if I actually needed to keep them. They are clearly labeled in storage, and if I don’t miss them by the time the season to wear them is over, I can safely get rid of them without any doubts. 9. Put seasonal items in storage. I have a tendency to fit as much into my dresser and wardrobe as I can — it’ll be 90 degrees out and you can still find long sleeve shirts in my dresser. 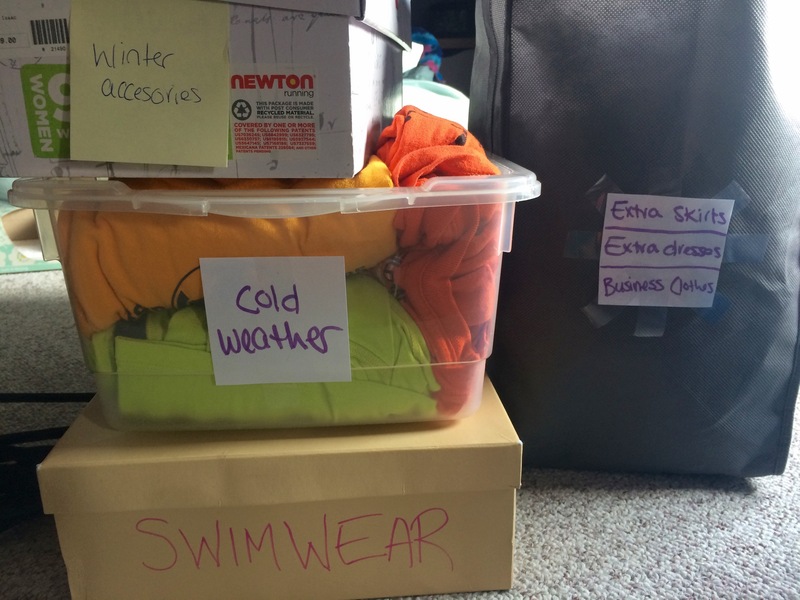 To avoid clutter, I put items I know I’m not going to wear or need for this season in storage. When the weather cools off, I’ll rotate out some of my summer-only items in exchange for cold weather clothes. I really don’t need four pairs of sweatpants right now — I’ll survive with just one for when my sister uses our AC to pretend we live in Antarctica. 10. 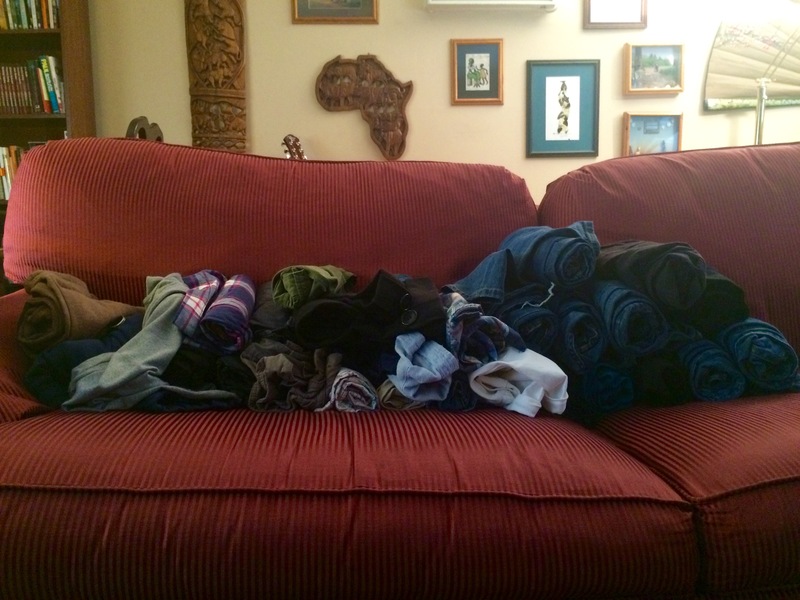 Compared my tops to bottoms to help decide whether to keep or toss. I laid out my skirts and tops to get a visual idea of what matched with what. If I had a top or skirt that only matched one or two things (or in some cases, nothing), then chances are it went into the donate pile. 11. Made a “to buy” list. 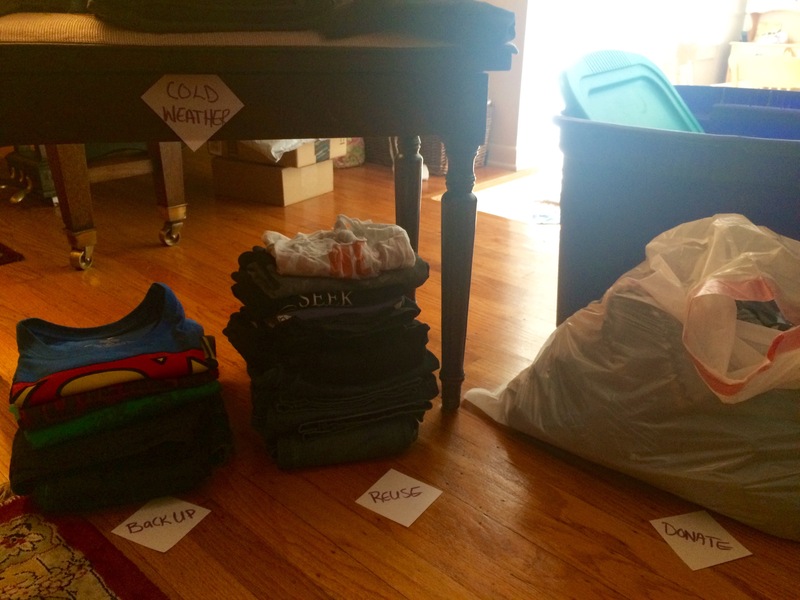 As I was sorting my clothes, if I found there were pieces I was missing or needed to replace, I kept track. Next time I’m shopping, I’ll know exactly what pieces I need (or would like, really), which will hopefully help prevent impulsive purchases. 12. Put everything back and reveled in the extra space. 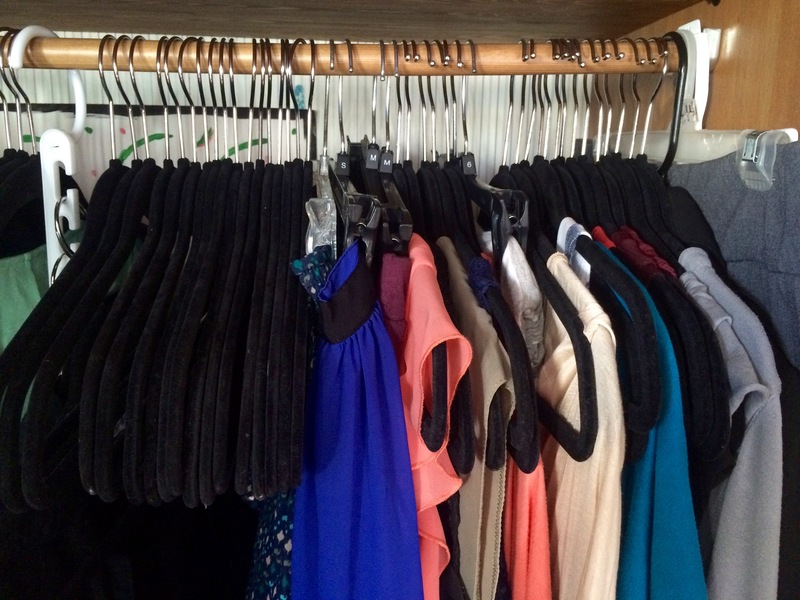 With a significantly lighter wardrobe, I was able to better organize my clothes. I cleaned out over 20 hangers and had an extra drawer and wardrobe shelf by the end of my purge. Instead of having to root through piles of clothes, I can see all my options, which will help avoid ignoring certain items just because I can’t see them. Hopefully my sister is happy with her extra shelf now. If you have any tips for cutting out clutter or cleaning out your wardrobe, let me know in the comments below!